On November 24, 1917, 324 British tanks, supported by 8 infantry division, advanced along a 10,000-yard front against the German lines near Cambrai, in Flanders. A combined-arms assault, plus the use of new artillery techniques, initially smashed the German trench line. In several places, the attackers suffered almost no casualties and, by the end of the day, recorded gains of three to four miles. Would it be possible this time to break through to the "green fields beyond"? British euphoria over the success of the offensive was dampened only by the loss of 47% of their tanks of the first day. Breakthrough: Cambrai is a two player game simulating the British assault to breach the "Hindenburg Line" between November 20 and December 3, 1917. One player controls the British forces, the other the German forces. The object of the game is to control a certain number of areas on the map or, for the British, to exit units off the map into certain perimeter zones. Breakthrough: Cambrai is an area-movement game which uses impulse mechanics where players alternate "mini-turns" of moving or attacking. The impulse nature of the game means little or no down time for each player while waiting for the other to complete a move or attack. 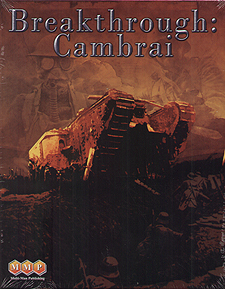 Breakthrough: Cambrai is a two player game of the British attack in late 1917 that saw the first major use of tanks. Victory comes from controlling a certain number of areas on the map or, for the British, by exiting units off the map into specific perimeter zones. In other words, they will have broken through To The Green Fields Beyond to use the tile of the first SPI simulation of this battle. This game has been years in gestation and I was beginning to fear it would never see the light of day. Thankfully, it eventually achieved the magic P500 mark and reached our gaming tables. What we have got is an area-movement game which uses mechanics that first saw light of day with Avalon Hill's Storm Over Arnhem. Players take mini-impulses activating units in a single area and the British player is racing against the clock and a neat General Haig rule to make every impulse count. The designer, Michael Rinella, is noted through a whole sequence of games such as Monty's Gamble [yet another take on Operation Market Garden - and a very good one too] and several ACW games for continuing to develop and cause the original system to evolve. This is certainly true of Breakthrough Cambrai and a fine achievement it is. In the early stages the British are constrained by specific avenues of attack and they need to make every use possible of those precious tanks in the early stages of the game. The German player is desperately on the defence shoring up a thinly held line. Having played the early SPI game To The Green Fields Beyond where a single turn could labour through 2/3 hrs, this is a fast moving game that easily sits in an evening's gaming. It is played out over a splendid area movement map with some of the most attractive large counters employing graphics both for tanks, infantry and cavalry.